Except a few, most of the fruits are low in calorie, but rich in vitamins, minerals, antioxidants, and other beneficial nutrients. Due to the limitation of carbohydrate and sugar intake, a person with diabetes should include a certain amount of diabetes-friendly fruits in his/her daily meal plan. Different fruits are available in many parts of the world at the different time of the year. Some fruits are available even throughout the year, but some are seasonal. Fruits not only help meet your hunger but also their anti-oxidant prevent further cell damage, regulate blood sugar level, protect your heart, nerves, and eyes. Thereby, with enormous health benefits of fruits, following diabetes-friendly fruits are recommended in your diabetes food list. Guava contains a high amount of vitamin A, vitamin C, and dietary fiber. It is also good for constipation, which is a common problem for diabetic patients. 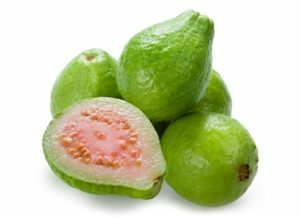 Due to its low GI, guava makes a healthy food for diabetes. 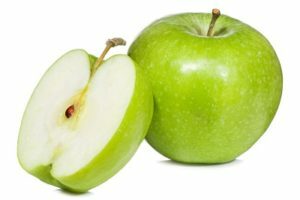 Taking of a small size apple can reduce your hunger. It has a good source of vitamin c, another vitamin, and minerals making it a diabetic friendly fruit. Apples are rich in soluble fiber that slows down the absorption of sugar into your blood[ii]. It also reduces inflammation related to diabetes and heart diseases. Some people may worry about the high sugar content of an orange. 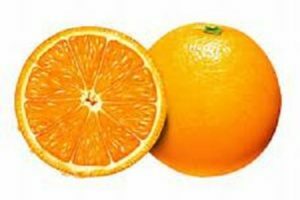 But it is healthy citrus foods help reducing insulin resistance and manages to control insulin[iii]. These are high in vitamin C and can be consumed on daily basis as one of the healthy foods for diabetes. Berries are low in carb and packed with fiber and vitamins. Blueberries, blackberries, raspberries, and strawberry contain very less amount of carbohydrate per servings[iv] and can be added to diabetic foods list and diabetic friendly fruits. 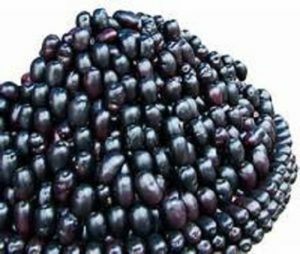 But the Indian BlackBerry, which is also known as ‘Jamun’ is one of the super healthy foods for diabetes. It is also one of the best remedies for control of blood sugar level. Seeds of Indian blackberry contain glycosides, which prevent the conversion of starch into sugar[v]. 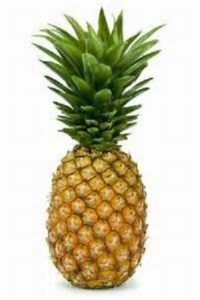 Pineapple is a good diabetes-friendly fruit. It is also good for health with its anti-viro, anti-inflammatory, and anti-bacterial properties. 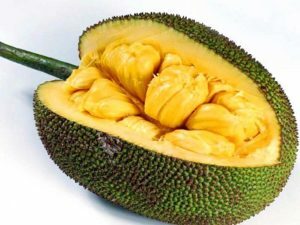 Jackfruit is very rich in vitamin A, Vitamin C, riboflavin, calcium, iron, manganese, and magnesium, potassium etc among many other nutrients which are good for diabetes[vi]. As these nutrients help improve insulin resistance, jackfruit can be included in your diabetic foods list. Papaya is filled with anti-oxidants, which helps to prevent the deterioration of the body’s cell structure[vii]. Unlike much other fruit, papaya being sweet has low sugar content. 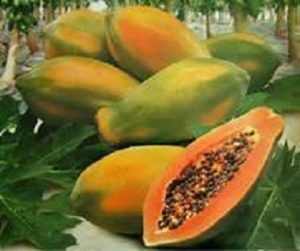 Thus, a person with diabetics can include papaya in his/her daily menu as a good diabetes-friendly fruit. 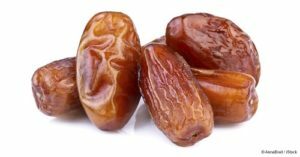 Dates are good choices for sweetened food for diabetic persons. They are low on the glycemic index (GI) and can crave sugar level in the blood[viii]. Carbohydrate in dates can provide instant energy and the high fiber content in dates is good for digestion. This sweet fruit is cholesterol and fat-free and thereby dates can be served to diabetic person as one of the healthy foods for diabetes. 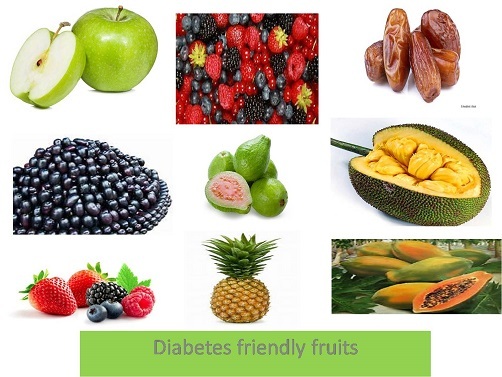 A person with diabetes can also eat most other common fruits, like, apricot, avocado, banana, cantaloupe, cherries, dates, grapefruits, grape, honeydew, melon, kiwi, mango, peaches, pears, watermelon. But serving for each fruit should be kept limited in his/her daily diabetic foods list.